Just because your equipment has wheels in it, doesn’t mean it’s necessarily portable. 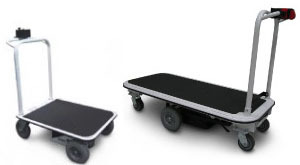 The sheer size, weight, or configuration of your otherwise “portable” equipment can make it unsafe for any employee to transport across your operation, despite the casters attached to accommodate servicing or storage. In order to prevent the excessive push/pull forces that result from moving anything from process equipment, small machines, and compressors, to generators, speakers, or sports equipment, you need to consider augmenting or retrofitting it with ergonomic technology. Almost any type of equipment with casters on it can be retrofitted to eliminate dangerous musculoskeletal disorder-causing push/pull forces. At Electro Kinetic Technologies, we routinely provide retrofit kits, which include a charger, drive system, transaxle, drive wheels, batteries, and hand controls to make equipment both safe and easy to move. This normally includes safety features such as a dead-man’s switch, horn, and emergency stop, and custom features such as warning lights can be added as well, all aimed at preventing runaway equipment and collisions. A simpler retrofitting method involves removing the existing casters, and mounting your equipment onto one of our standard or custom motorized platform carts. Depending on your operation, application, and budget, an engineer will make suggestions as to which type of retrofitted solutions will work best for you. It’s also possible that not all of your portable equipment can be modified, and for those types of applications, our engineers often suggest augmenting your process with a motorized solution that hitches up to your equipment and pulls or pushes it along. These are tuggers, and they can be purchased with a variety of hitch accessories that can connect to any one of your pieces of equipment and tug it along like an SUV moves a trailer, all without causing injury to your staff. For operations that don’t have tight spaces or the need for enhanced maneuverability, a tugger solution is both economical and effective. Another possible solution for this sort of application would be either a standard or custom motorized cart. This option works best for operations that already have safe loading solutions for moving heavy equipment onto a platform cart, like a small crane, whereby your manufacturing equipment, possibly with casters removed, can be placed and secured onto the motorized platform cart for ergonomic transport. However, the feasibility of these solutions is dependent on safe loading and unloading capability. Any one of these solutions could make your workplace safer and more efficient, but we won’t know until we assess the situation. To have an engineer help identify any hazards, areas for logistical improvement, and possible solutions to your equipment transport problem, contact us to schedule a walk-through of your facility.